Buy lithotripter "Urolit" Buy lithotripter "Urolit" Buy lithotripter "Urolit" Buy lithotripter "Urolit" Buy lithotripter "Urolit" Buy lithotripter "Urolit" Buy lithotripter "Urolit" Buy lithotripter "Urolit"
The Urolit Nanopulse Lithotripter, produced by MedLine, Ltd. (Tomsk), is designed for contact nanopulse lithotripsy. 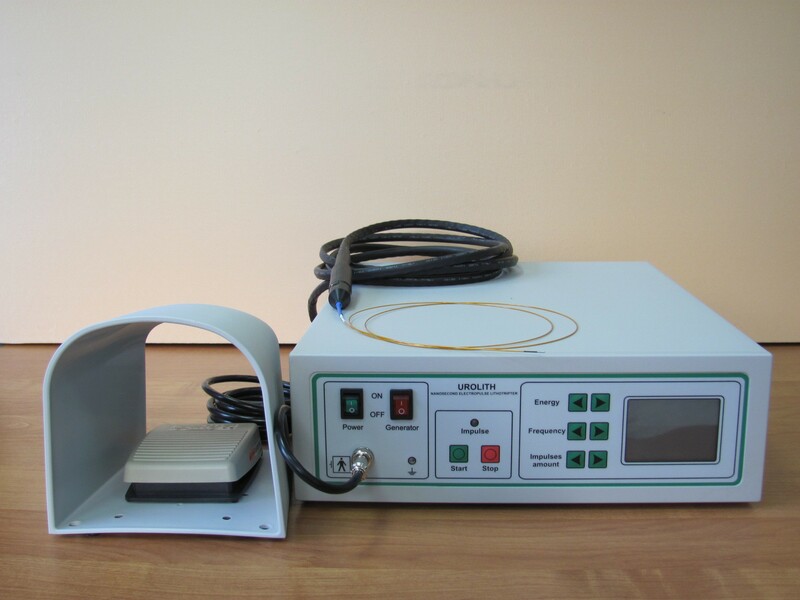 The device is recommended for use in specialized medical institutions for contact destruction of urological stones in the human urinary tract. •Successful operation in more than 150 urology departments of Russia and the CIS states. •Recommended by leading Russian urologists. •Easy and reliable to use. •Compatible with all types of endoscopes. - In cases of bladder stone fragmentation, it is possible to completely destroy concrements without their migration and injury to mucosa, which is especially important before transurethral prostatic resection. - In cases of kidney stone fragmentation, it is possible to fragment and remove splinters not only from the renal pelvis and the large and small calyces, but also from the calyces of the inferior pole of the kidney. - Owing to the availability of small-diameter probes, the lumen of the operating channel provides an adequate flow of irrigation fluid and ensures good visibility. - Good destruction capability for fragmenting stones of any density; only a few pulses are required in the ureter to turn concrements "into sand". - The device is compact, easy to use and control.